Despite being one of, and arguably the most iconic superhero of all-time, Superman’s track record in the world of film hasn’t been one to brag about. The first two films in the series of films that debuted in 1978 are enjoyed (though I myself am not a huge fan), but the last two are unanimously ridiculed. The reboot/retcon/sequel Superman Returns released in 2006 has also endured its fair share of criticism. 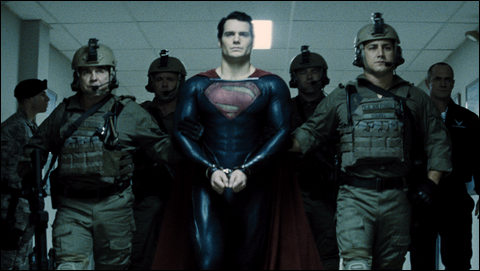 Despite this, Zack Snyder’s reboot, Man of Steel, received incredible hype to be the first great Superman film. And to be honest, I bought into the hype. The film had some great promotional material, including an awesome trailer or two. However, I’m disappointed to report that Superman’s return to the silver screen wasn’t so super after all. Krypton is dying and as if that were not enough to deal with, General Zod (Michael Shannon) is leading a coup, and wishes for Jor-El (Russel Crowe) to join him. Poor time to choose to overthrow your government, but whatever. El refuses and sends his newborn into space to find a new home, along with a codex containing all of Kryptonian DNA so that their race may once again live. Zod and his followers are eventually apprehended and banished to the “Phantom Zone”. Jor’s son sent into space was Kal-El—raised on Earth as Clark Kent (Henry Cavill). Clark’s childhood experiences are told via flashback, alternating between his ventures as a young man attempting to “find his place” in the world. The decision to tell his story this way was a poor one. Instead of watching him grow as a character, we receive information out of order for no real reason. Here lies a big part of the movie’s problem as well—Clark’s character arc never serves to challenge him as a person as an adult. Throughout his youth he is told that he’ll have to decide what kind of man he wishes to become, but as a man, he displays little depth or conflict outside of physical confrontations. Man of Steel moves quickly, introducing characters such as Lois Lane (Amy Adams)—his love interest—and others without much characterization or character interactions to make you empathize. The film is focused more so on rushing to the reintroduction of Zod and his followers, who, after escaping the Phantom Zone, have come to Earth to obtain the codex and turn Earth into a new Krypton. What follows is a nonstop barrage of action scenes, shaking cameras, and special effects—albeit nice ones. However, after the action begins, it’s like a roller coaster that never gives you a chance to breathe. It becomes tiring, and you become dull to the escalation. The film seriously struggled with pacing. Despite a capable performance from Cavill as the titular Man of Steel, he failed to compensate for the blandness of his character. There was a strong foundation to really test Superman’s morals and allegiance, but the first half of the film is rendered pointless by the unfulfilled potential. It merely served to fill time until the senseless carnage could begin, where characters the film never took the time to invest us in are endangered, and we honestly couldn’t care less. It just dragged and dragged without any of the joy, fun, or heart present in the Donner films to balance out the body count. It never convinces you that a man can fly.